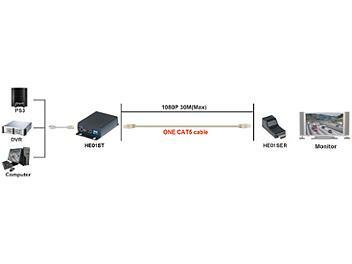 Extends HDMI signal over one CAT5/5e/6 cable. Transmission range up to 50M at 1080i, 30M at 1080p resolution. Work with passive receiver as economic type. No external power requested at HE01SER receiver unit. Extend the transmission distance up to 50M at 1080i / 720p. Extend the transmission distance up to 30M at 1080p. Package include one HE01ST transmitter, HE01SER receiver, one power adapter.